Open Control Panel and click the System And Security link. Under BitLocker Drive Encryption, click the Manage BitLocker link. In the BitLocker Drive Encryption window, click Manage BitLocker. Duplicate The Startup Key When you use a USB startup key for authentication, this allows you to create a second USB startup key with an identical key. Reset The PIN When you use a PIN for authentication, this allows you to change the PIN. For detailed information about how to use Manage-bde, run manage-bde -? at a command prompt. One of the boot files is modified. BIOS is modified and the TPM disabled. An attempt is made to boot without the TPM, PIN, or USB key being available. The BitLocker-encrypted disk is moved to a new computer. After the drive is locked, you can boot only to recovery mode, as shown in Figure 3. On most keyboards, you can use the standard number keys from 0–9. However, on some non-English keyboards, you need to use the function keys by pressing F1 for the digit 1, F2 for the digit 2, and so on, with F10 being the digit 0. If you have the recovery key on a USB flash drive, you can insert the recovery key and press the Esc key to restart the computer. 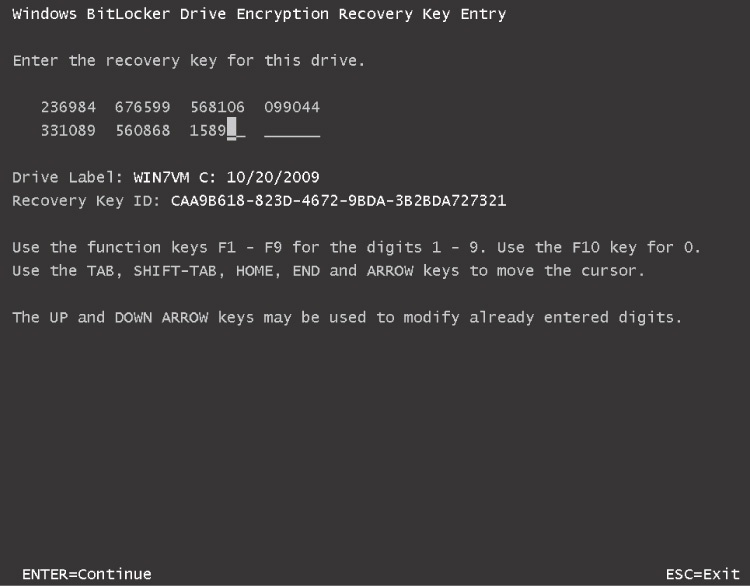 BitLocker reads the recovery key automatically during startup. If you cancel out of recovery, the Windows Boot Manager might provide instructions for using Startup Repair to fix a startup problem automatically. Do not follow these instructions; Startup Repair cannot access the encrypted volume. Instead, restart the computer and enter the recovery key. As a last resort, you can use the BitLocker Repair Tool (Repair-bde) to help recover data from an encrypted volume. The BitLocker Repair Tool was a separate download for earlier versions of Windows, but it is included in Windows 7 and Windows Server 2008 R2. If the system volume becomes corrupted, you can start Windows 7 Setup from the Windows 7 DVD, start the repair tools, and open a command prompt to run the BitLocker Repair Tool. Alternatively, you could attempt to mount the volume to a different computer and run the BitLocker Repair Tool. Because it can be difficult or impossible to recover a corrupted BitLocker-protected drive, it's especially important to back up BitLocker-protected drives regularly. Note, however, that your backups might not be encrypted by default. This applies to system image backups, as well. Although system image backups make a copy of your entire disk, BitLocker functions at a lower level than system image backups. Therefore, when system image backup reads the disk, it reads the BitLocker-decrypted version of the disk.